Hi! I didn't find anything explicitly discussing this topic in the forum so excuse me if I missed it. I'm wondering about how well asymmetrical ships can fly. As I have understood from the videos explaining ship flight, they are utilizing Newtonian physics, and my first thought was that won't it be more problematic to make asymmetrical ships fly now? I personally enjoy oddly shaped spaceships, for an example Star Wars ships that come in all different shapes and sizes. I don't remember which video it was about shipbuilding, but they had a real-time calculation showing forces on your ship (propulsion, gravity etc.). And there they placed thruster on the sides to make it turn and so on. So, the problem I'm seeing is that asymmetrical ships have a serious disadvantage (as they do in real-life) when it comes to balancing the forces affecting it. Can this problem be solved or is it a non-issue? Because if you just clutter to whole damn ship with these thrusters just to balance it will most likely look ugly. For an example I think the B-wing look really cool but trying to replicate in DU and make it fly might be a challenge. Maybe a work around could be that you can place thrusters beneath a thin layer of the hull or something, just to keep the aesthetics of it. Of course, that won't be an immersive thing to do, but for the sake of the looks I hope it could be accomplished. Other things I'm also thinking about are core-centering versus cockpit-centering in 3rd person view. But that's all for me now, I hope you guys have something that might help with this problem I'm seeing OR is this a non-issue, that I'm just overthinking it, making it more complicated than it really is? 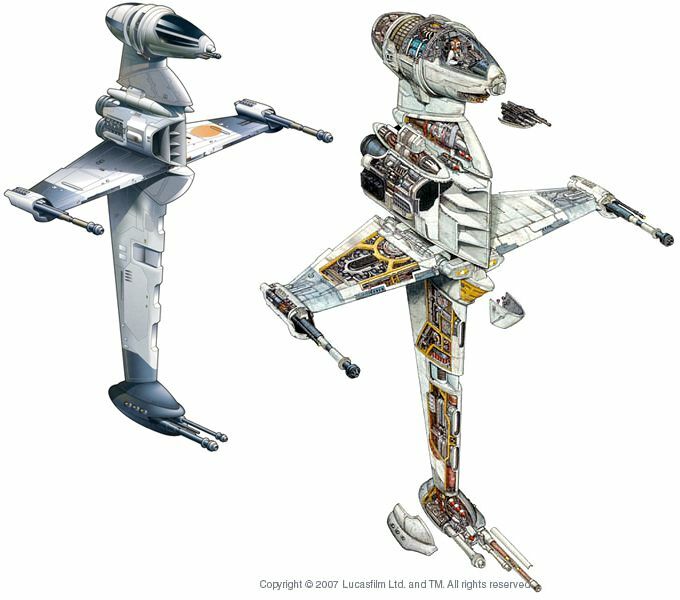 Anyway, enjoy this cross-section picture of a B-wing! If you can tweak the thrusters, to should be able to balance the thrust out, it would just be a lot of tweaking to get it to work. Once you’ve got it to work, you will of course also have to worry about taking damage, although that would throw symmetrical ships off balance too. You could also possible use small maneuvering thrusters for rotations to balance out the forces, which might make dealing with balance changes due to damage easier, maybe with a script that auto-stabilizes you. You would then of course have to worry about not going straight forward. Assymetrical ships will almost certainly be harder to make and design, but seems like a fun little challenge, and if you get good at it, I imagine it would be a good distinguishing feature in the design market. I think that the main engines don't actually apply a torqueing force to the ship- they just push in the direction they point. Not much can be said at this stage about rotational mechanics. Mostly just speculation. Some system of automatic thrust stabilisation should be there of course. Something that will tone down right side engines when left side ones get damaged (or someone just forgot to put them there). But using it should reduce efficiency - it'd be kind of last resort system, not free easy mode. I reckon having automatic thrust stabilization should be something the players have to invent and produce instead of being something already implemented into the game. This could give more incentive for people who want to sell their ships to make more advanced, interesting and convenient systems. I really Love the direction this game is heading mainly due to the focus on everything is player made. This can form some really amazing game experiences as you could have companies making things that others cant therefore forming a purpose for currency. @Hughesy Good point. For that we'd need access via Lua to center of mass position and all engines thrust vectors. But NQ do provide some built in AI - they added automatic emergency stabilisation already, as well as automatic control mapping for all propulsion. So I wouldn't be surprised if we get thrust stabilisation too. Im pretty sure torque is a thing in space too, however, as you said the main engines in DU wont apply torque effects from everything I've seen as it would be very hard to balance a ship - especially one hauling ever changing cargo and passenger distributions. Sure air/space thrusters will/do provide variable torque depending on their placement on a ship/craft - but thats the extent of torque play in ship design. Also, without engines applying torque, you wouldn’t be able to turn. They have RCS thrusters for that. and they said that the Default Lua would have the engines balanced, so as long as you made sure you had your centre of thrust roughly in line with your centre of mass, your ship can adjust the individual engine thrust to get net 0 torque on your ship. Very interesting. Can I get a source? Just to answer an old post. You can make any shape flight worthy. Or even as good as a perfect ship. The only thing that you will need is MORE time and MORE knowledge spent on it. So yeah it's easyer to make an sphere fly the way you want it. Then it would be to make a big lump of an uneven mass. If you aren't an aerodynamics engineer, you probably will need a bunch of trials to make such a starwars spaceship "air tight" in it'S flight behavior. But it is certainly doable. But that shipdesign you showed, is actually pretty nifty and easy to tune. "It’s important to note that some engines are capable of generating force, while others are capable of generating torque, but not necessarily both at the same time. This is done to make your life simpler, as it’s much more difficult to control a ship that has thrusters generating force and torque at the same time (in most of our early testing, this was considered as too problematic by most people). We might introduce a way for players to reactivate the force+torque capability of all engines for added complexity, if you so choose. Let us know what you think about this! The bottom line is that if you have engines that are capable of generating only force (like atmo or space engines) and you tag them with a “torque” tag, this will do nothing."